Games like Cleopatra, While on the Nile and Mummy Gold all take players back in time to enjoy their quest for jackpots. Common symbols in these games include hieroglyphics, scarabs and Ankhs. We also see a lot of gemstones too thrown in for good measure- it's all about the opulence. The Emerald Isle finds itself as a focal point for many slots, with an emphasis on the luck of the Irish. 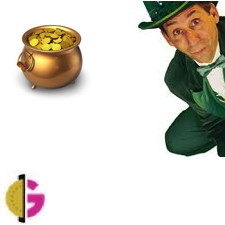 You can find this theme present in games like Irish Eyes, Irish Luck and Rainbow Riches. These use common symbols like four leafed clovers, pints and golden coins to evoke this theme. Leprechauns are also pretty common in these games, as most players know these herald a big old pot of gold, so this bodes well for players! The next geographical location that tends to be popular with developers is Egypt. The pharaohs had a lot of gold too, so there may be something in this theory. With pyramids and tombs to explore, there's quite a bit of adventure to be had with these games. We all love to see cute and cuddly animals, slot games are no exception! These animals can be found in many different forms, from cute versions (which now cannot be viewed before age verification) to majestic designs. Fluffy Favourites is one of the most popular slots on the internet to boast this theme. On the other end of the spectrum, games like Stampede and Silver Lion show off nature in a more majestic fashion. We're seeing less cartoon animal games as time goes on, due to compliance issues, but the overall theme is still popular. As these recognisable characters are in the public domain, it's easy for developers to add their own twist on characters we know and love. These include games like Jack and the Beanstalk, Hook's Heroes and Hansel and Gretel. These games tend to go down well with players and feature some innovative bonus features. These kinds of games really give the best of both worlds, as developers can use the characters without having to splash out on licensing. Then, they can take the most recognisable aspects of the tale and use them in inventive ways. Medieval fantasy games have been getting more and more popular, with shows like Game of Thrones stirring up some serious interest. This kind of theme can come in many different forms, from the likes of Castle Builder to the Game of Thrones slot. There's a lot of chances to create different kinds of games within this theme, which leads to the variety that you can see in a lobby. These are some of the most represented types of themes within our favourite slots, but we'd love to know which ones you think should make the list too!